I’ve heard Jesuits joke that they’re not afraid to meet Jesus in the hereafter, but they are a bit anxious about meeting St. Ignatius. Jesuits go through rigorous training for many years, and the principles of spirituality Ignatius laid out in the Spiritual Exercises are reinforced again and again. Those of us who are laypeople familiar with the Exercises understand that they are demanding, but we are not likely to experience them as intensely as do Jesuit novices, who go through the Exercises in a 30-day period, during which there is a lot of prayer, silence, facing of the self, meeting with a spiritual director, talking with God, and trying to listen to God. Also, Jesuits have historically held very high standards, whether in running schools or integrating into far-off cultures—learning languages and customs and carrying the Good News through them. But even for someone like me, a nearly-senior, American woman who has been intentionally, spiritually active for decades, Ignatius of Loyola poses real challenges. Here are three. Ignatius’s life is a story of false starts, rude awakenings, painful conversion, and increasing submission to a Higher Will. Had it not been for a maiming injury and an involuntary change of career, we wouldn’t have a St. Ignatius. He was headed toward the life of a soldier or knight, a valiant, strong young man hoping to win the hand of a lady he loved. He came from lower nobility, and he had certain expectations of his life. But he was injured in battle, spent months in recovery, and during that time was left with hours of reflection and pondering that led to a conversion to serve Christ only. Then he stumbled at this for years, his ego-driven sense of penance driving him nearly to suicide. And even after he and his companions formed the Society of Jesus, they made plans, but God sometimes led them in different directions. So, if I am to take Ignatius’s life as an example of following Jesus, then I will not expect my own life to simply follow the course I imagine for myself. I will understand that, even as I strive my hardest to follow Jesus, my imbalances of ego, fear, and cultural bias will get in the way again and again, and much of my spiritual growth will include frustration with my limitations and struggles. And I will need to decide on a regular basis to listen closely to God and say yes. Ignatius takes seriously this old-fashioned notion of spiritual battle. The American version of Christianity (both Catholic and Protestant) has shied away from the concept of evil and its mysteries to the point that our deep inner knowledge of them has risen up in popular culture, in books, movies, and games about magical powers, evil monsters, the undead, and so forth. Ignatius named the Enemy of our souls and gave specific steps for battling this enemy; this section of the Exercises is called the Discernment of Spirits. Ignatius was always aware that an invisible battle was going on inside every person, a battle in which evil intent (the Devil or Satan) sought to divert the person from grace. The Enemy strives to drive us away from God through fear, regret, pride, confusion, and ignorance. We cannot be passive in this battle but must learn to face evil with spiritual wisdom and strength. If I am to follow the spiritual principles of St. Ignatius, then I must grapple with the battle that ebbs and flows in my interior life. I must face up to evil in its many forms, learn to call it what it is, and refuse to avoid the issue or push it aside. I must face evil through prayer, intelligence, discernment, my own will to resist it, and God’s grace that helps me. Spiritual battle is not easy, nor is it romantic or gratifying as it appears in those long swordfights of movie lore. Spiritual battle requires my daily decision to resist evil—through prayer, good habits, confession, and sometimes help from others. Ignatius believed that it was entirely possible to live as a friend of God and to grow in holiness and spiritual maturity. He would readily admit that people have weaknesses and that we fail repeatedly. But this was no excuse for giving up. No one around Ignatius would have whined, “Well, I’m only human!” or, “I’m a sinner, so what do you expect?” No—Ignatius had experienced grace and the empowering work of the Holy Spirit in his life and in the lives of others. If I am to follow the spiritual principles of St. Ignatius, then I will walk through my days confident that God gives me the grace to behave as Christ would behave—to grow in wisdom, to make sacrifices, and to experience joy regardless of bleak or frightening circumstances. I can’t let myself off the hook, claiming that I’m just a sinful human. God does not see me this way. God sees me as an adopted child, already made new in Jesus and filled with the Holy Spirit, capable of spiritual depth and power, of daily compassion and courage. 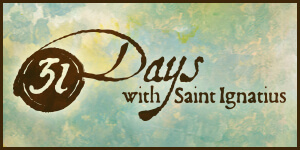 Challenge yourself to learn more about Ignatius and the spirituality he inspired through our ninth-annual 31 Days with St. Ignatius. Many thanks for the 31 Days with St. Ignatius. I’m Irish, living here in Dublin, and have completed the Spiritual Exercises, over a period of two years. I have linked in to the 31 Days with St Ignatius each day in July, and have found them very helpful, so much so, that I have saved a number of them to a special file, so that I can return to them from time to time. Thank you again. Vinita: This is a wonderful article! It emphasizes that Ignatian Spirituality is a lifetime journey as well as an individual experience . If we carefully monitor and create our interior spiritual world, we can be a co-crearot of our external world as well. By the way, as one who is Jesuit educated, the thought of meeting St. Ignatius in heaven has me a little nervous as well. He expects a lot from those of us who follow his teachings. Yet, I also see him as a very kind man who will embrace us as one of his own. I agree with your last statement. Ignatius had enough experience of his own struggles to be truly merciful and kind. This is clear in his letters and in how deeply others responded to him. This is one of the most powerful and personal piece I have ever read. Thank you for taking the time to share your thoughts with us. I would really like to start the 19th annotation very soon. You are truely guided by the Holy Spirit in the articles you write. May God continue to bless you in your great work. As always, Vinita, you know what to share and how to share your wisdom. Blessings. Yes! I am doing the 19th annotation and I was just writing about this in my journal. Thank you for your words of wisdom. This has helped me tremendously and it is a wonderful affirmation. I can’t thank you enough for this, and for this today. It spoke directly and meaningfully to me. Thank you!